Me visiting Laura Ingalls Wilder's birth site in Pepin, Wis.. Happy birthday, Laura Ingalls Wilder! The author of the beloved Little House series was born Feb. 7, 1867, in a log cabin the big woods of Wisconsin. She and her family went on to move around the country, and she later wrote a life-inspired children's book series. My mother bought me a copy of Little House in the Big Woods at a book fair when I was in first grade. I've always liked my name, and when I saw a book written by a woman named Laura about a little girl named Laura I knew I had to have it. At 6 the book was a little too challenging for me to read on my own. I remember cuddling with my Mom as she read chapter after chapter to my sister and I every night before bed. Though she watched the TV series when she was younger, my mother had not read the books, and so it was a new experience for all of us. We quickly fell in love with the story, and I received the remaining books in the series for my birthday. Mom read a couple of the other books with us, but I soon took over reading the rest of the series on my own. When I finished Laura's books, I read the books about her daughter and a few of the prequels written about her mother and ancestors. Though I enjoyed them, they never had quite the same effect on me as the original series. 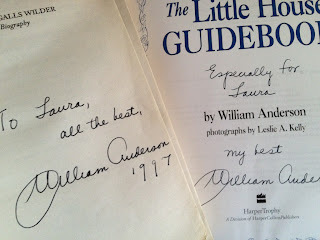 and The Little House Guidebook by William Anderson. After devouring the series, I moved on to researching the real life author. I read biographies, resource books and any other information I could get my hands on as an elementary school student without an Internet connection. 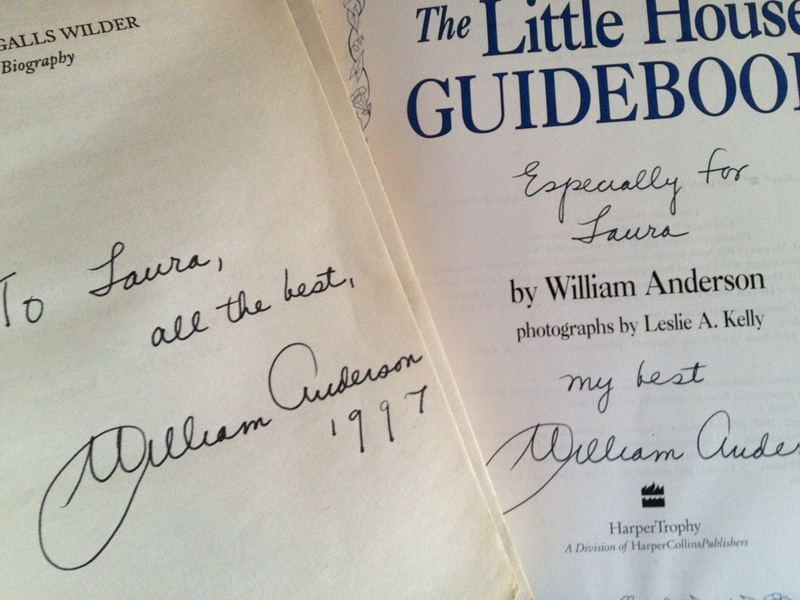 Always supportive of my interests, Mom took a friend and I to meet William Anderson, probably the best-known LIW biographer. We listened to his presentation, and after we went to a book signing. We had a short chat, where he offered encouragement for my own writing career and talked about my shared first name. He also autographed my copy of the biography and guidebook he wrote. Fifteen years later, both are still prized additions in my personal library. Throughout elementary school I took piano lessons, which turned into oboe lessons in middle school and high school. To fulfill both interests, my parents bought me The Laura Ingalls Wilder Songbook. Though my piano skills were never that great, I made myself learn "In the Starlight" — the song Laura sings to Almanzo before he proposes to her — and today it is one of a handful of songs I can play without sheet music (or with it, quite honestly). Because I fall into the category of LIW fans who name These Happy Golden Years as their favorite in the series — I've always been a romantic — from the age of 9 to 18, I re-read the book at least once a year. When I was 23, I picked it up after a few years apart, and was amazed by how much I still loved the story. The Wilder Homestead, as featured in The First Four Years. 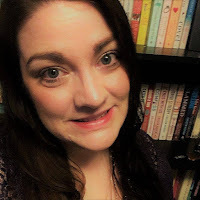 Since I decided to make blogging a bigger priority in July, I have had the opportunity to pursue my LIW interests more deeply than I had in years. This blog became an avenue for me to share my details about visiting some of the home sites and trying out recipes from the book. • My visit to LIW's birth site in Pepin, Wis.
• My visit to De Smet, S.D., the setting of By the Shores of Silver Lake, The Long Winter, Little Town on the Prairie, These Happy Golden Years and The First Four Years. • Laura and Almanzo Wilder topping my list of favorite couples depicted in literature. • My attempt at baking green pumpkin pie from The Long Winter. • Making molasses and snow candy from Little House in the Big Woods. And if you check back tomorrow, you can see another Reading in the Kitchen recipe based on one of the books. Perhaps the greatest legacy LIW's work has had on me is my passion for the written word. Though I read and liked other books, these are the ones I credit with my love of reading and writing. They taught me the power of words and stories. Though I always liked to hear and tell stories, I knew after reading these books that I wanted to be a writer. I also learned invaluable lessons that I continue to carry with me. Throughout the series, LIW and her family face hardships, they work hard, they struggle and sometimes they face unhappy moments that could easily defeat an individual. But they pushed through them. They continued to work even harder, and they found moments of happiness in the hardships. 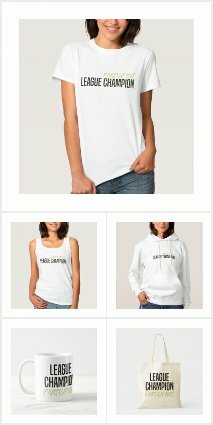 I'm curious if I have any other LIW fans out there? What was your favorite book, and do you ever geek out like I do? Laura, While being stationed in Fargo, North Dakota I had to make several business trips to Sioux Falls. I passed DeSmet several times, finally stopping in to see all the sights. It was a visit I will never forget; I could almost hear her voice on the prairie. I'm glad you stopped. I thought it was definitely worth the time. And you're right: Even with all the modernization, you can still feel its past. Oh yes, huge fan. Visiting the home sites is #1 on my bucket list, and I hope to meet you at LauraPalooza! I can't choose a favorite book, however; I love them all so much. Yay! I'd love to meet you, too. When the time gets closer we'll have to coordinate. I have loved all things Laura for over 40 years and I'll be at LauraPalooza too (I believe we're on a committee together)! ♥ Can't wait to see all of my old Laura friends and meet some new ones too. I'm glad you'll be there, too. I'm looking forward to meeting everyone from our committees in person — and everyone else, too. This will be my first time attending, and I'm pretty excited about it. I loved, loved, loved this series as a kid too. I read everything LIW related that I could get my hands on as well. It's so great to read how much this series impacted you...thanks for sharing that with us. galentine's day/ valentine's day winners!